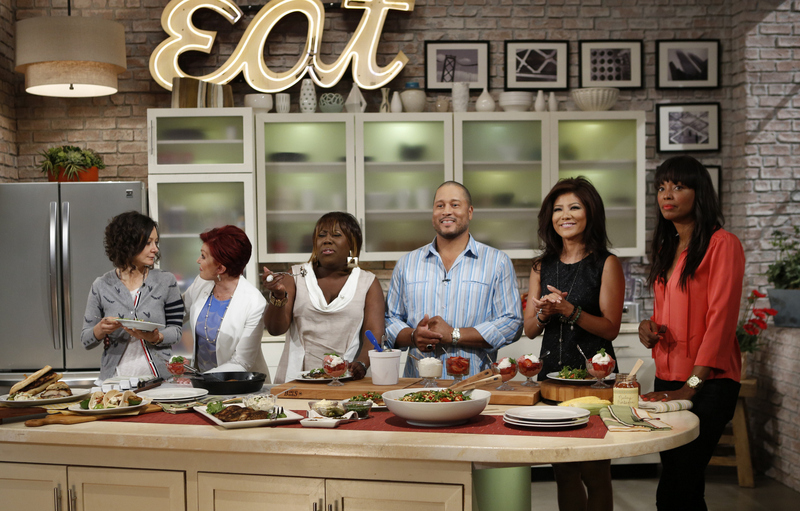 Food Network star Pat Neely shows co-hosts Julie Chen and Sheryl Underwood how to cook up the perfect light, satisfying summer meal on THE TALK as part of the show's month-long food festival, Monday, July 8, 2013 on the CBS Television Network. Sara Gilbert, from left, Sharon Osbourne, Sheryl Underwood, Pat Neely, Julie Chen and Aisha Tyler, shown. Photo: Cliff Lipson/CBS ©2013 CBS Broadcasting, Inc. All Rights Reserved.